As soon as the weather starts warming up, I crave fresh fruit! To celebrate St. Patrick’s Day, we decided to make some rainbow fruit kabobs with our kids. My kids loved helping put these together and they were obsessed with the fluffy marshmallow dip! My kids loved helping me make these Rainbow Fruit Kabobs! They are such a fun, healthy snack! 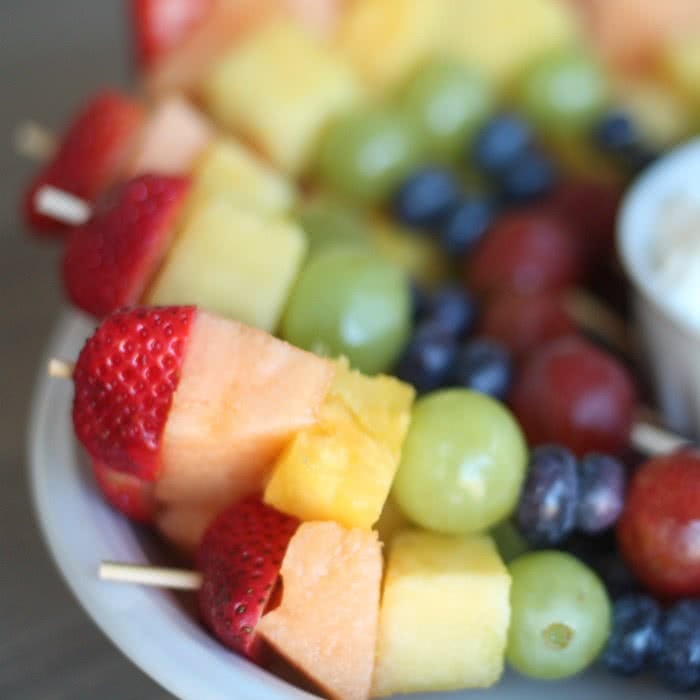 Slide a piece of strawberry, cantaloupe, pineapple, a green grape, two blueberries and a red grape onto each skewer; set aside. In a mixing bowl, beat together whipped cream cheese and marshmallow creme until smooth. Refrigerate until serving. A fun idea for any spring or summer get together!